While out and about walking with the kiddos we hit up my fav store, Trader Joe's! I bought all our normal staples then happened upon some salmon burgers for 110 calories in the frozen section and snagged them. The burgers had a few options for cooking, I opted for the toaster oven. The box came with 4 burgers for $5.99. Two of the patties were frozen together so popped the two in the oven and began my hunt for toppings. 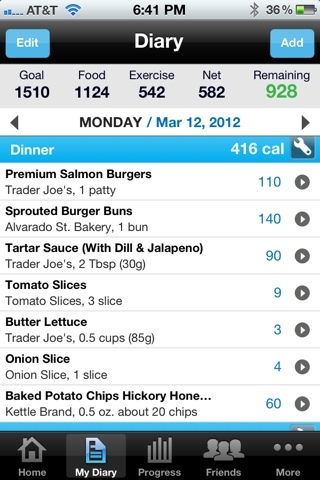 BINGO, spotted TJ's dill and jalapeno tarter sauce in my fridge and hoped the calories weren't too bad. 90 cals for 2 tbs, SOLD! Next up was the bun. Recently I found these amazing hamburger buns made by Alvarado Street Bakery. They are 140 calories for one bun and well worth the extra 40 calories to have a real bun over a skinny sandwich thin somedays. This bakery is VERY local to us, although if you check out the website it seems you can find their products all over. I got mine at Whole Foods. I have yet to try any of their other products, but I am sure I wouldn't be dissapointed. I toasted up the bun and smothered each side with 1 tbs. 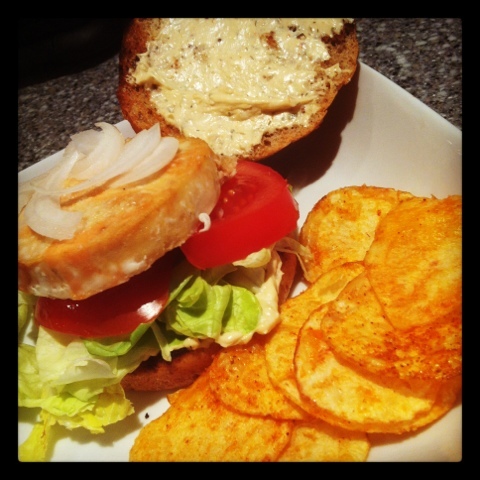 of the tarter sauce then topped it with lettuce, tomato, and onion. I paired it with 1/2 a serving of baked BBQ kettle chips for 60 calories. Grand total for this meal was 416 calories and worth every single one. I am adding this sandwich to the very top of my list. 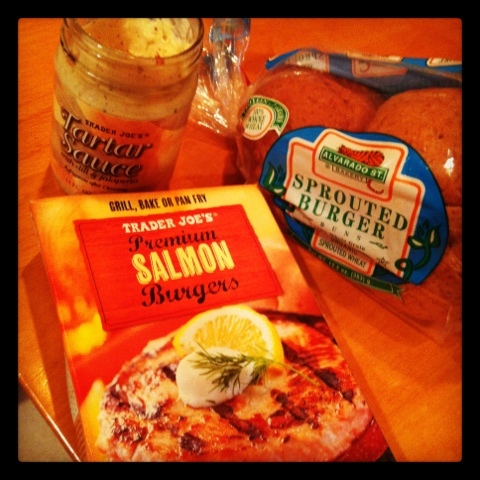 Today for lunch I will crumble the other salmon burger over a greek salad and my freezer will never be without Trader Joe's salmon burgers.